I enjoyed your recent interview with the New York Times. You sounded almost rational until you went off the rails with your rant about losing our “sovereignty” in the Southwest due to all the immigrants coming over the border from Mexico. Sorry, Steve you are on the wrong side on this one. There are more Mexicans actually going back to Mexico than are coming into the States and unemployment is at its lowest level in 10 years. I don’t want to upset you, but here is some really bad news: for the first time in the history of the U.S., there are more white people dying than are being born. Also, in California (one of the strongest economies in the world), there are more nonwhite citizens than white citizens. Steve! Do you really want to spend the rest of your life holed up in Coeur d’Alene, Idaho watching torchlight rallies and attending weekly Wagner concerts? The “dark side” is much more fun! Our African, Asian and Hispanic neighbors offer a rich variety of skills, food, culture and music which have enriched our quality of life immeasurably. And besides, you can’t even find a decent K.K.K. rally anywhere. The food is crappy and those new fire-resistant hoods required by OSHA are hot and miserable. And then there is the issue of tribalism and brain damage. As you know racism, fear, anger and hatred are associated with over-stimulation of the amygdala, which results in the production of certain stress hormones. This can lead to serious illness ranging from high blood pressure to bi-polar disease. Frankly, Steve, you haven’t looked very well lately. An MRI might be a good idea. If it indicates that your primitive, lower brain stem is over active, there are surgical procedures that can result in a more reasoned and rational thought process. The cerebral cortex is the key to human evolution and as we inexorably evolve as a human race, white supremacy and patriarchy are doomed! 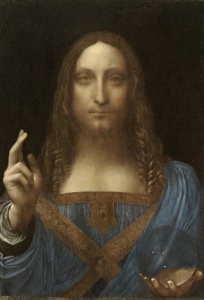 Knowing your devout Catholic background, Steve, I can imagine how upsetting you found the recent tweet from the president, declaring that the Da Vinci painting of Jessica (pictured above) “turned him on” and that “Christianism was a patriarchal, fake religion.” The tweet also claims that recent artifacts obtained by the new Hobby Lobby Bible Museum prove that it was Jessica, not someone named Jesus, who was the inspiration for this new religion. The most compelling evidence supporting this claim is the female DNA found on the Shroud of Turin which is on display at the museum! Apparently, Da Vinci was aware that the early patriarchy of this new church changed the narrative of Jessica, the woman socialist revolutionary, to that of a male martyr with the name of Jesus. Notice the female features in the painting above. Also, if you look up under the garments of the person seated in the center of Leonardo’s other religious masterpiece, The Last Supper, there are a pair of great legs.